Having L plates on the front and rear of the car is a legal requirement for any learner driver, and although P plates are not mandatory, they are recommended for new drivers. 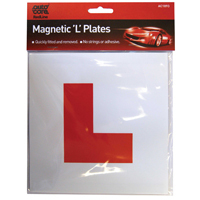 A red 'L' on a white background, set to certain dimensions, is a legal requirement for anyone learning to drive a car. This applies to professional driving testers and private lessons from friends or family members. Failure to display the right size could mean six penalty points on the licence - before they've even got it! P plates, meanwhile, are not mandatory. However, for new drivers, they are recommended as it alerts other road users to the fact that this driver has only just passed their test, and should be given a little more time and space to make decisions or respond to others. You get free UK delivery on our L and P plates, while we also offer next-day delivery options or a free click and collect service form any of our UK stores.